ShriDesk | Why every one need this Vitamin F? Why every one need Vitamin F? 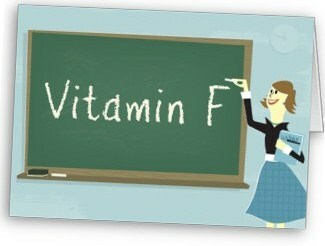 What is Vitamin F? Yes! Friends!!! Why do I have a variety of friends who are all so different in character? How can I get along with them all? I think that each one helps to bring out a "different" part of me. With one of them I am polite. With another, I joke. I sit down and talk about serious matters with one. With another I laugh a lot. I listen to one friend's problems. My friends are like pieces of a jigsaw puzzle. When completed, they form a treasure box. They are my friends who understand me better than I understand myself. They're friends who support me through good days and bad. Dr. Oz calls them Vitamin F (for Friends) and counts the benefits of friends as essential to our well being. Research shows that people in strong social circles have less risk of depression and terminal strokes.If you enjoy Vitamin F constantly you can be up to 30 years younger than your real age. Why do we light a lamp at Indian home? Why do we do Pradakshina(circumambulate) Around Temple? Why do we wear marks (tilak, pottu and the like) on the forehead?